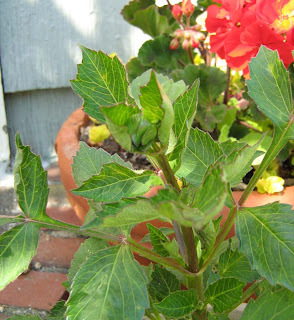 Lynch Creek Dahlias: A Bud - And Some Bugs - on my Dahlia! My thriving little Baby Red dahlia has a bud. Having isolated my dahlia from the flower beds and armed the pot with every slug repellent available, I've got a perfectly respectable, healthy little first-year plant. It's the first dahlia that's survived in the 16 years I've gardened at our present home, where I tend to operate on the Darwin principle and everything else that's growing there is largely slug-and-snail-resistant. Jubilant though I am over the achievement of a bud on my dahlia, and figure I can look forward to a late summer display of dahlia flowers, I have to admit that all is not perfect in my pot-Garden of Eden. My dahlia has a few tiny chew marks, evidence of aphids. So it's soapsuds time: a little dish detergent in water and a sprayer. I may be over-reacting; probably, at this level of impact, simple hosing with water would be effective. But with all my eggs in one basket, I'm overprotective. I'd like to add some ladybugs to my arsenal, but the last time I bought a flock of ladybugs to cope with aphids on my roses, they sleepily arranged themselves on the roses, got their bearings, and flew next door. My neighbor was delighted with all the ladybugs that appeared in her garden. 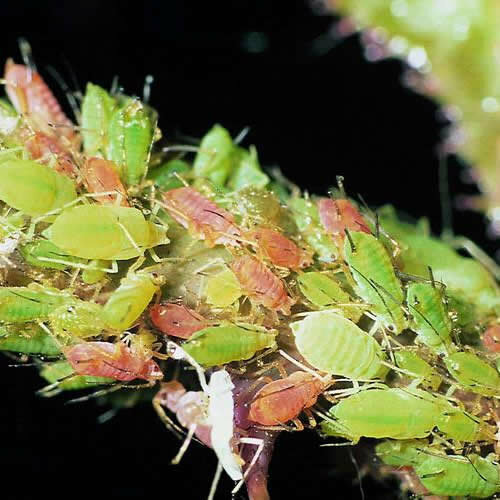 Back to aphids: those tiny soft-bodied fliers, are sucking insects (functionally as well as descriptively) that prey especially on the tender greenery of new growth. This is one reason that Andy and the crew at Lynch Creek Farm (whose dahlias are thriving, by the way) advise against heavy fertilizing of dahlias during their growing season. It's important to deal with aphids as soon as you see evidence of their presence. 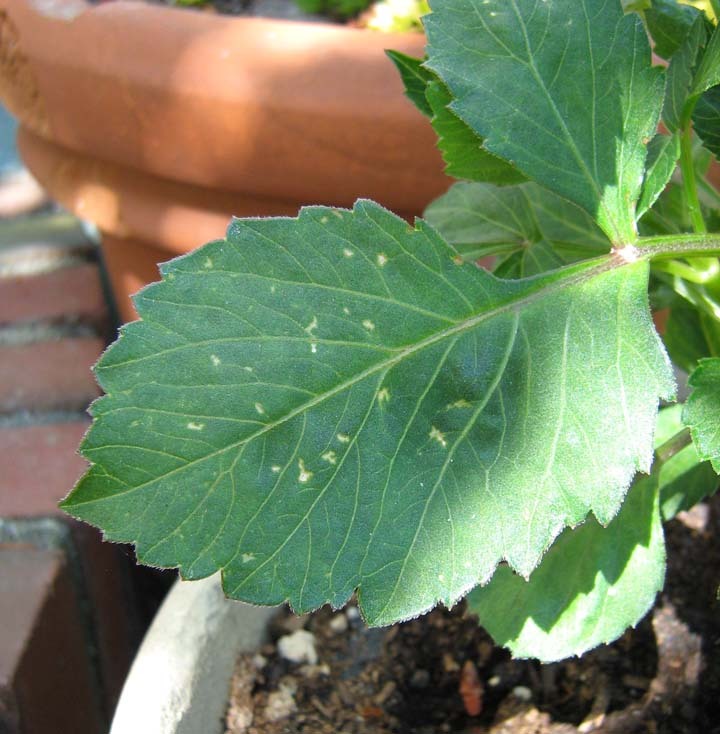 Besides the cosmetic impact of little chew marks, or little bugs, on the foliage and blossoms, there's the fact that aphids are a major vector in the transmission of viruses. And while you can get rid of aphids, you can't get rid of viruses. So if you see aphids on your dahlias, get on their case.